Now we are taking wonderful biscotti, from warm Italy to sunny Öland/Sweden. 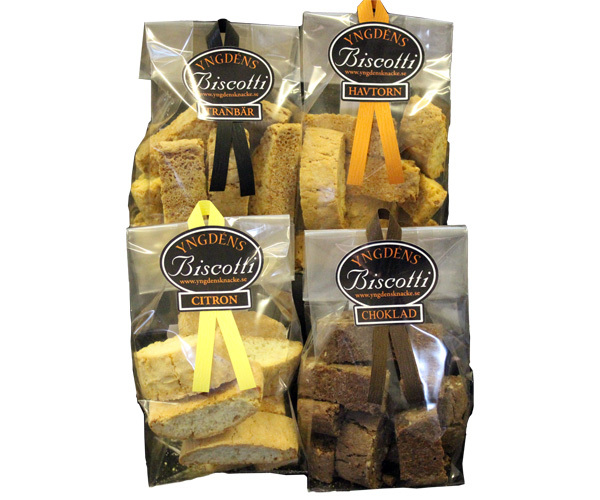 We have three different flavors of our biscotti, which you can see by the bags label. But you can also distinguish the different flavors using the color of the bow that adorns the bag. We have flavored our biscotti with the vitamin C-rich buckthorn berry. Cranberries gives lovely acid to our biscotti. Ingredients: Wheat flour, sugar, egg, margarine, almond, cranberries and baking powder. To satisfy all chocolate lovers we have started to bake biscotti with wonderful rich chocolate flavor. Ingredients: Wheat flour, sugar, egg, margarine, almond, 55% dark chocolate, cocoa and baking powder. This biscotti is flavored with juice and lemon peel of fresh lemon, which gives the biscotti a fresh and healthy flavor. Ingredients: Wheat flour, sugar, egg, margarine, almond, juice and lemon peel of fresh lemon and baking powder. This biscotti is flavored with traditional cardamom. Ingredients: Wheat flour, sugar, egg, margarine, almond, baking powder & cardamom. The biscotti are packaged in fancy cellophane bags of 200 grams.